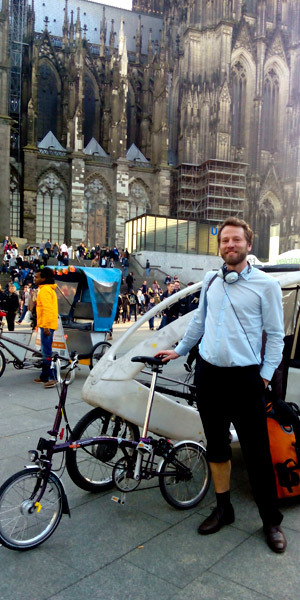 Michael Traut, Research Associate in the Manchester Enterprise Centre, took a Brompton folding bike on a work trip to Cologne, Copenhagen, Hamburg and Gothenburg. In March 2015, I travelled to a conference in Copenhagen and also visited a collaborator at Chalmers University, Gothenburg. I travelled by train – a multi-leg journey from Manchester to London; from London to Brussels; from Brussels to Cologne; from Cologne to Hamburg; from Hamburg to Copenhagen (with the whole train loaded onto a ferry for part of the trip); and, finally, from Copenhagen to Gothenburg; and back. I took my Brompton bike with me. It was easy to take along wherever I went and it was incredibly useful. I had a good hour to spare when changing trains in Cologne so I rode through the sunny city, catching lots of fresh air and loosening up my limbs from sitting on a train for so long. I rode around Hamburg where I spent a few days on either side of the conference. The Brompton took me from Gothenburg railway station to the hotel I stayed at; and from the hotel to Chalmers University. That’s a free, flexible, healthy way of getting around and you don’t have to look up any connections or timetables. Similarly in Copenhagen. A splendid city and I would have loved to spend more time there and get to know it better. But cycling around the city’s cycling super highways, at least I got to see some of the city and I’m proud to say that I was not overtaken once (the cycling lanes are so broad that there are effectively two cycling lanes and people overtake on the left). Everywhere, in the UK and abroad, a lot of people started talking to me about the bike, asking what it’s like, saying they think it’s cool, or just giving me the thumbs up (when I folded it up outside the window of a cafe in Gothenburg, an elderly couple inside clapped their hands afterwards and laughed). So it’s been very useful and I would recommend it to others.